The RMT union made the announcement as members prepared to stage a fresh wave of strikes in the Stirling area on Hogmanay and 5 January. 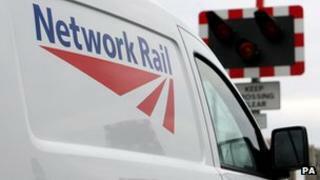 The union claimed Network Rail had refused to negotiate over RMT proposals for 12-hour shifts for signallers. Network Rail said a full service of trains would run on strike days and it did not expect to amend any timetables. It said the proposed changes to working patterns would "considerably increase" its operating costs. The RMT has been calling for staff to be moved to 12-hour rosters, which would see the number of working days change from five to three but the length of shifts rise from eight hours to 12. The dispute has seen signallers in the Stirling area take strike action on several occasions, including Christmas Eve. Staff at Stirling Middle, Stirling North and Dunblane will take part in the next wave of strikes. RMT general secretary Bob Crow blamed "management intransigence" for the length of the dispute and said the union had not ruled out escalating the action. He added: "We are now in the process of consulting signalling members across Scotland on the implications for the wider workforce of management's refusal to negotiate a reasonable settlement within existing rostering agreements. "Our members have shown their anger through their rock-solid support for the earlier waves of strike action, with pickets out in force sending a clear message to the employers that RMT is determined to win this fight." Mr Crow added that the union was available for "meaningful" talks. Network Rail said: "There will be a full service of trains running - we have never amended the train timetable for any of the previous strikes. "The dispute is over the length of the signallers' rosters. The current rosters agreed with the trade union are eight hours long. "The union wants to move to 12-hour rosters. Network Rail's position is that this would considerably increase its costs so it has proposed a compromise, which the union is refusing to accept." Earlier this month, ScotRail workers called off strike action which had been due to take place on 22 December and Christmas Eve. The move followed talks between the RMT union and the company over a dispute sparked by the sacking of a ticket examiner.